The Tramex MEP Moisture Encounter Plus is a non-destructive overall building inspection moisture meter which has applications for numerous industries. 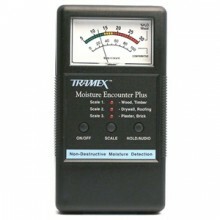 It has many unique features that make moisture measurement and evaluation fast, precise and versatile. Deep signal penetration to over 25mm (1") into the materials being tested without the need to damage the surface. Signal penetration depends on material being tested and meter setting. Three ranges of sensitivity: Wood & Timber / Drywall & Roofing / Plaster & Brick – making it ideal for testing moisture conditions in various building materials. High moisture audio warning tone. top rated canadian pharmacies online bu.y.ciali.s.onl.ine. Klik tombol di bawah untuk menambahkan MEP - Moisture Encounter Plus ke Daftar Keinginan Anda.